Wow! The past ten days have been nutty. My poor 6 year old daughter has been out of school with pneumonia. We have been battling, fevers, horrific coughing, really bad nose bleeds, very messy sneezing and extreme boredom. The good news is that she is finally feeling better and is able to return to school. Now I have time to share with you this recipe I have been holding onto. A friend of mine was kind enough to find me a package of Gingerbread Oreos. 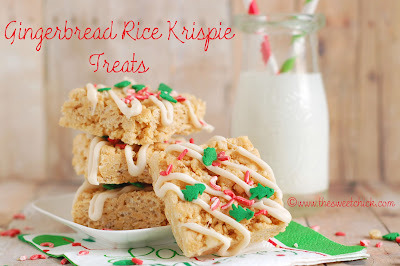 I have been wanting to make gingerbread Rice Krispie treats, so this came at the right time. I am a big fan of Rice Krispie Treats. They are chewy and crunchy and you can make them so many ways. Aimee over at Shugary Sweets has a love of them also. She made her Gingebread Rice Krispie Treats using Jello Gingerbread Pudding mix. Check out her recipe here. I have yet to find gingerbread pudding mix in any store. I was lucky just to get the Oreos. I did taste one before chopping them all in the food processor. They really do taste like gingerbread. Oh, and the smell of Oreos as they were being chopped up was heavenly. I think I need to get a gingerbread candle. While you can make these are regular squares and decorate them any way you like, I though I would have a little fun. I pulled out a gingerbread man cookie cookie and cut out a few little guys to decorate like gingerbread men cookies. You can even put them on a popsicle or lollipop stick for the kids. These would be great for a school Christmas party or to make for Santa on Christmas Eve with his glass of milk. I really like how they came out. Simple, but cute. You can embellish them with mini M&M's if you prefer. I used Wilton's white and chocolate candy melt to make the gingerbread man and I used Wilton's eggnog candy melt for the squares. Remove from heat and add Rice Krispie cereal and chopped Oreos. Mix until all is well incorporated. When treats have set, melt candy melt per directions on package and place in a piping bag or Ziplock bag with tip snipped off. 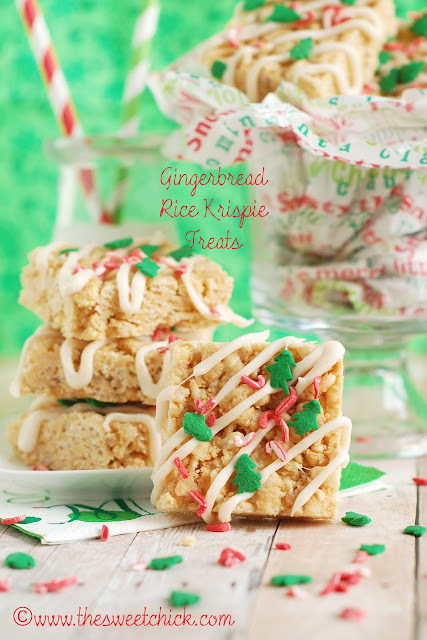 Drizzle the candy in diagonal pattern across the Rice Krispie treats and add sprinkles. After candy melt had hardened, cut the treats into squares and have a bite! Oh no! I'm glad she's better. How horrible. But....I love these treats. The man one is so awesome! Glad your little is doing better! And I am dying over that rice krispie man...that is just way too cute!!! Oh my god, I am happy your daughter is feeling better. I had the same thing when I was a little older than her and I remember I had to breathe cortisone through a machine mornings before school and evenings before bed during au month or so. 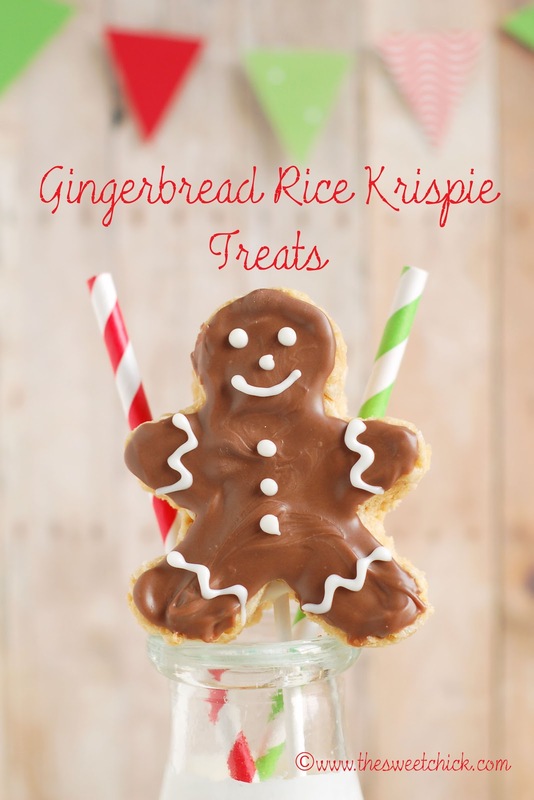 I absolutely love your treats, I was actually planning to make some rice krispies treats sometimes soon ; I'll make yours that look absolutely yummy. Thank you Sebastien. Thankfully she only needed antibiotics. I see that you like cupcakes. Your Orange, Honey and Spice ones look really tempting. Glad she is doing better! My my my these look so cute and delicious!!! Thank you. I would love to join the link party. 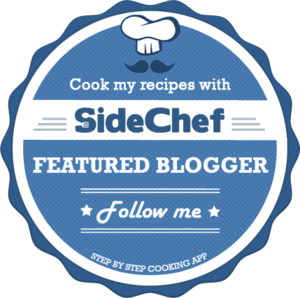 I will check out your blog.